Dark Souls II players using the DualShock 4 on PS3 have reported that they've accidentally purchased content on the PS4's PSN Store, and Sony is refusing to offer a refund. 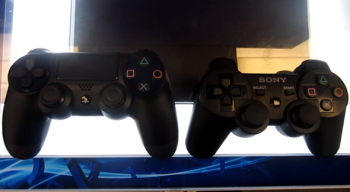 It's been known for a few months now that the PlayStation 4's DualShock 4 can be used for some games on the PS3. However, what you're about to read might make you rethink doing that in the future. According to forum posters on the RLLMUK forums, some users are reporting that playing Dark Souls II using the DualShock 4 on the PS3 has resulted in them accidentally purchasing items off the PS4's PSN Store. If that wasn't bad enough, Sony is said to be refusing to issue refunds. Ok, most of you will find this funny (I know I would), I'm fuming. Playing Dark Souls 2 on the PS3 with my PS4 controller, I leave my PS4 on as it's downloading updates. Turns out the controller can control both at the same time. So my inputs on Dark Souls buy me FIFA on PS4 (a game I already own) and British Cop skin pack (I don't even know what this is). Get an email on my tablet telling me so. Ask to speak to his superior and they won't come on the phone. He then tells me support staff have said it's not possible to control two devices at once. He doesn't seem to believe me. Half of me wants to trade this in for an Xbox with Titanfall right now. Another user by the name of LongHairStu, also shares his tale, and yes, he was also playing Dark Souls II. Yeah, hi. *Raises hand* Me too. Kind of. I had two Dark Souls sessions - at midnight, when the PS4 pad seemed to work fine, and at lunchtime, when I couldn't get it to work. Can't remember why, but it must have been disconnected when I turned the PS3 on, as fixing it took switching everything off, plugging it in (changing USB port at the time), and restarting. Then it worked. When I saw the standby light on the PS4 later on, I figured I'd just turned it on. I was mortified when I saw Battlefield there, and then I noticed that I'd watched a film as well. I guess it must have been in that time that the PS4 pad wasn't properly connected to the PS3 that it happened. Notwithstanding the distance selling point, I appreciate that I might not have a leg to stand on, but I'll be looking to ask anyway - I can't easily weather a Â£68 loss. Hell, I have zero interest in Battlefield 4 (hey, if only there was some way of selling on digital content...), if it had been Assassin's Creed 4, or Need for Speed at the same price, or Strider/Trine 2 for Â£15 or so, I probably could have taken it on the chin. So, yeah, fuming is a word I can get on board with. Guess I'll email Sony, but I'll be leaving my dignity at the door. Really taken the shine off what was an otherwise great day. My birthday, as it happens. And do keep laughing - I've laughed at it now and then, it doesn't really pay to get too snarled up over it. We've reached out to Sony for a statement regarding its refund policy and what they have to say on the matter. If and when the company responds, we'll update the post accordingly. As someone who honestly didn't know that you can control both consoles at the same time using one controller, I'm glad I heard of this before using the DualShock 4 on my PS3. Or is this something that's exclusive to Dark Souls II since we haven't heard of this happening before? So, for those planning on using a DS4 on their PS3, make sure your PS4 is turned off first just to be safe. Either that, or unlink your credit card to your PSN account since there are all sorts of trouble that can stem from it. In your opinion, should Sony offer a refund for the accidental purchases? Or are the users to blame since Sony hasn't officially endorsed using the DS4 on the PS3 (at least from what I remember) and it's their duty to make sure their PS4s are turned off?